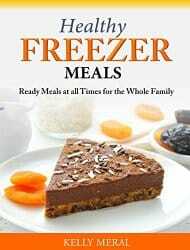 Hurry over to Amazon to get your free Kindle book about Healthy Freezer Meals! Did I mention it’s free? If you want to save money by preparing your own food, but don’t have a lot of time to cook, making and freezing meals is often a good option. This book will show you how to make delicious, affordable and nutritious meals that you can easily reheat at mealtimes. Just remember: The price of Amazon cookbooks can change at any time. So, download your copy today to get it for free! Ebook reminder: This book was free at time of posting (August 22nd, 2014) But, you should check the price before hitting the 1-Click button. You don’t need a Kindle device to read this book. You can download a free Kindle reading app to your PC, Mac, phone or tablet. You may also be able to read this book on your browser through the Kindle cloud service.